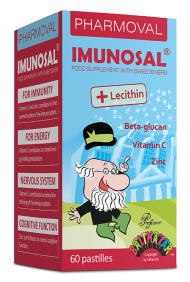 Imunosal® pastilles with beta-glucan, zinc, vitamin C and lecithin for children over 4 and adults. Chew 1 to 3 pastilles daily. Product is not recommended for children under 3. 1) Zinc and vitamin C contribute to the normal function of the immune system. 2) Vitamin C contributes to normal energy-yielding metabolism and to the reduction of tiredness and fatigue. 3) Vitamin C contributes to normal functioning of the nervous system. 4) Zinc contributes to normal congitive function.